According to the Public Health Industry of Canada, one in three Canadians aged 65 years and over will experience a serious fall each year, and half of those will fall more than once. Since most of those injuries occur at home in the bathroom due to slipping, tripping and stumbling, physicians/health professionals recommend installing senior-friendly bathroom features such as a walk-in tub. For many seniors and others with limited mobility, having to raise your feet up and over traditional bathtubs can be tricky. In order to avoid accidents, Bathway can transform your existing porcelain, steel, acrylic, or fiberglass bathtub into a walk-in shower. The result is easier and safer access in and out of your bathtub by helping to prevent bathroom slips and falls. You will experience more freedom of movement in your bath and less worry or fear of falling. Save thousands of dollars compared to remodeling the entire bathroom or installation of a prefabricated walk-in tub. The entire process only takes an hour! So if someone is coming home from the hospital and needs to access into the bathtub, you don’t have to wait weeks for help. Our tub to shower conversion can be sized to your specifications giving you a seamless factory-new look. We offer various finishes so we can even change the color of your bathtub if you like! Unlike the glued or caulked-on plastic inserts offered by others, the finished product looks completely seamless. Use non-slip rubber mats in front of sink, toilet and shower/bath. Install grab bars inside and outside of shower/bath and on either side of the toilet (these are much stronger than towel racks, which aren't meant to support weight). Install bright lights that are easily accessible. What's involved and how long does the entire process take to complete? 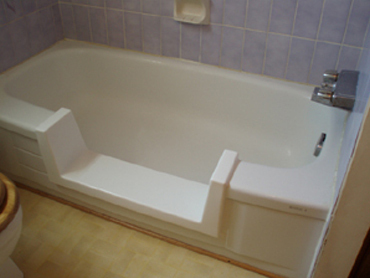 A tub to shower converison is a simple process which involves removing a section of the bathtub wall and then recreating a lower wall height for easier and safer access in and out of your existing bathtub. For added safety, Bathway can install a slip resistant texture to the bathtub bottom and the newly created step. Is the tub cutting process safe? The tub-cutting process should be done by a professional. This is not a recommended DIY project due to the need for highly specialized tools and training. We know you will be amazed with our quality work, fast service, and competitive pricing. Contact Bathway today to find out how we can help you create a safer entryway to your existing bathtub and ensure bathroom safety. Accidental falls at home are the leading cause of injury-related hospitalizations among Canadian seniors. Learn all the reasons its beneficial to invest in a low step-in tub installation.